Earlier this spring, Oscar woke up one morning with his eyes literally glued shut. He’s only two years old, so I am sure this is just one of the many strange medical oddities we will encounter in his lifetime. However, it was a first for us so I really didn’t know what to do. We called his pediatrician and ruled out the possibility of pink eye and other infections. We were told to watch it and that it was probably a cold. The nurse even mentioned that her own kids were in the middle of a similar issue and gave me some tips on how to manage it until it went away. As long as his eyes weren’t puffy, red, or oozing anything with color, we could just keep an eye on it. However, after several tearful mornings of Oscar versus the wash cloth we decided to call the pediatrician again. We realized that the issues all started after the surprise Raleigh Tornadoes that swept through our neighborhood unearthing untold amounts of spring pollen. Once we put two and two together we realized that it it could be allergies. Up until now, Oscar hasn’t been allergic to anything so on the one hand, I hate that he has to deal with it, but with his dad getting fall allergies and me being hit in the springtime, I suppose it makes sense. A few days and several doses of anti-allergy medication later, he was back to normal and we haven’t had another issue. I still feel a twinge of sadness each time I imagine him looking around for us with his eyes closed not even knowing if it is mama or dada coming to get him in the morning. He was a trooper, but there is nothing as sweetly sad as a sick little boy. I am so glad we were able to get to the bottom of it and you can bet next spring we will be ready!! Hopefully, this will be the last of it. I’d love to hear your best tips to make the Spring season more bearable for the little ones. Share below! For more tips on relieving allergies, visit www.Facebook.com/Claritin. I was selected for this sponsorship by the Clever Girls Collective, which endorses Blog With Integrity, as I do. Both my boys struggle with springtime allergies. Hubby has them, but I’ve never had to deal with it. We’ve done the generic kids zyrtec, but I’m not always good at remembering to give it to them. One doctor told me to make sure they have a good probiotic. I know, sounds weird that it would help. Essentially, whether by the food we eat or the medications we take, our bodies are not removing all the toxins they should. It is my understanding that the probiotics help restore that balance. 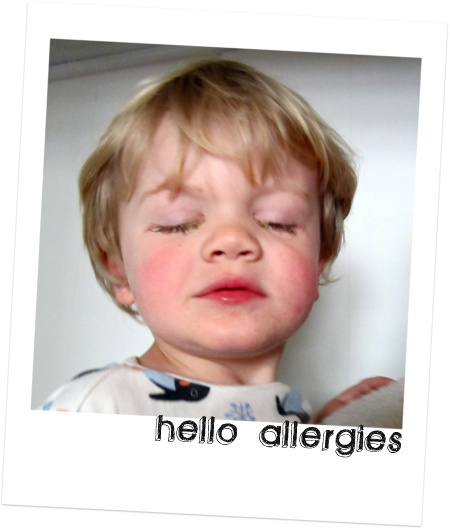 I’m happy to say that allergies are doing much better, and my youngest eczema is under much better control. We don’t have to use the steroid/antibiotic cream anymore. 🙂 We’ll see how the summer goes.